Facebook advertising is often the largest part of many social media marketing budgets. And yet, the education available on the topic is lacking. There are lots of marketers out there testing what works and what doesn’t, but very few are putting together strong research efforts to find industry best practices. Today we want to take our first step to help change that. 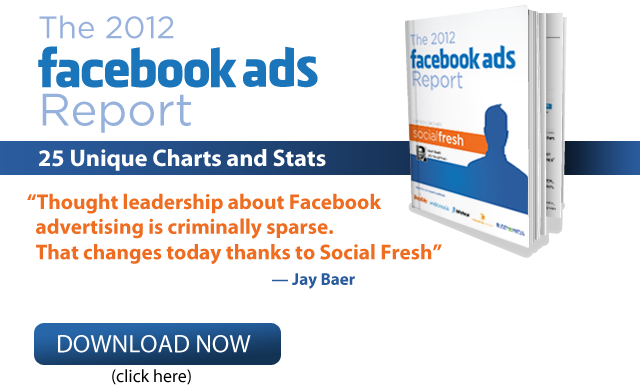 In February 2012, Social Fresh distributed our 2012 Facebook Advertising Survey. Thanks to Social Fresh readers and our research partners – Buddy Media, Convince & Convert, Likeable Media, Webtrends, and BlitzLocal – 347 Facebook advertisers completed the survey. From that data, we created this 2012 Facebook Advertising Report. Our goal is to start to understand how Facebook advertisers use the platform for marketing and where their challenges are. This will help us start to create better Facebook advertising educational content. The infographic below highlights just a handful of the unique stats and charts we covered in the full 30 page report, which you can download for free here.